Margarita Lopez, a NYCHA Board member, lesbian, environmentalist, and political figure in New York City, is changing the face of activism. At the heart of an activist there is a worthy cause (or several) for which she is passionate, an outspoken nature, and a toolbox of several well-worn tactics effective at bringing about change. A dedicated feminist and out lesbian, NYCHA’s Margarita Lopez has reached out to communities, politicians, and organizations to support her array of causes since before she moved to the United States in 1978. Her projects in activism have benefitted a broad range of communities. As an activist, she has supported women in domestic violence scenarios, protected the rights of the mentally ill and drug and alcohol dependent, advocated on behalf of the homeless, advised eco-friendly lifestyles and business plans for individuals and corporations, and promoted the rights of LGBT community members. 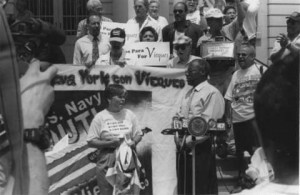 From 1998-2005, Lopez was a member of the New York City Council representing the 2nd Councilmanic District on the Lower East Side of Manhattan. During that period of time, she served as the Chair of the Council’s Committee on Mental Health, Mental Retardation, Alcoholism, Drug Abuse and Disabilities (the “Mental Health Committee”). Apart from those responsibilities, she also managed to serve as a member of the Council’s Finance, Contracts, and Environmental and Higher Education Committees. 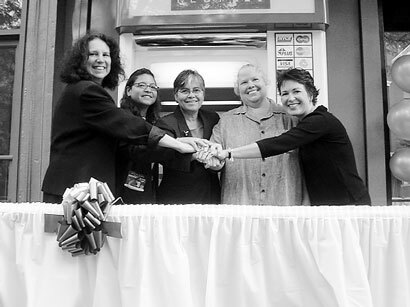 At ribbon-cutting ceremony, from left, Lynn Pentecost, Lower Eastside Girls Club executive director; District Leader Rosaura Mendez; City Councilmember Margarita Lopez; Mary Spink, Lower East Side People’s Mutual Housing Association executive director; and Veronica Ballass, Lower East Side People’s Federal Credit Union manager. Before securing her role at NYCHA, Margarita Lopez founded the Lower East People’s Federal Credit Union in the 1980’s. According to an article from The Villager, “…when financial institutions had abandoned the east side of Alphabet City, the Lower East People’s Federal Credit Union was born at 37 Avenue B. Credit union officials and local politicians hailed the new mini-branch as a sign of Loisaida’s continuing economic revival.” The article also quoted a founder as saying, “We want to focus that we’re emphasizing financial education and providing affordable financial services [at the mini-branch],” highlighting relief that this financial institution provided communities desperate for financial education and economical credit union services. In 2006, Mayor Michael Bloomberg appointed Margarita Lopez as a NYCHA Board member. Since her involvement in the New York City Housing Authority began, Lopez has continued to support her plethora of causes, especially her dedication to protecting the environment. She has supported many community garden openings, served as the face of Green NYCHA, and partnered with other New York City organizations to promote eco-friendly ways of business and life. As an activist and role model, NYCHA’s Margarita Lopez has consistently worked to defend communities in need of protection and advocate for what’s right.